Sindh, the region with a unique and distinctive past overwhelms one and all with its history. Its past holds many untold stories and the cultural treasures of the region continue baffle the living. The history attached to this region is unparalleled. It is a land blessed with rich traditions, cultures, customs and values. The glory and greatness of this land lies in the fact that Sindhi culture and heritage dates back to the ancient times of the Pre Vedic era. It is widely believed that Sindh gains its name from the mighty river Sindhu (Indus) and is synonymous with the Lower Indus Valley. Throughout its length, from north to south, the region assumes a pattern of three collateral belts, a central stretch of rich fertile land bisected by the long and meandering shiny line of the Indus, flanked to the west by the rocky ranges and surrounded on the east by the sands of the semi deserts. Sindh, to the absolute astonishment of all showcases the mystifying contrasts between the barren and the fertile. The early history of Sindh opens up with contacts with Iran. As early as 520-515 B.C. Darius I sent an army and annexed Sindh to the Persian Empire. Two centuries later, Alexander the Great stormed Sindh in 326-325 B.C. during his sweeping march through the valley, which has been fully described by Greek historians. The Mauryans later ruled Sindh before Greek rule was re-established by the Bacrian Greek conquest of N. W. India in 195 B.C. This was followed by the conquest of Sakas or Seythians and Kushans (120 – 200 B.C.) the introducers of the cult and culture of Turkish tribes. Subsequently through the centuries, this great land was intermittently ruled by the Persians, Rai Dynasty, Umayyid Rule, Sumras, Sammas, Arghuns, Turkhans, Mughals, Kalhoras, Talpura Mirs and finally the Britishers. It is strongly believed that Sindh could preserve its political independence for longer periods in history due to its geographically isolated position. Sindh, perhaps of all the provinces, which constituted part of the British Empire was the least affected by Imperial Rule. It was the last to fall into British hands, having fought off the invaders till as late as 1843. Even the earlier history of Sindh shows that it enjoyed much freedom and could fight to safeguard it. Situated along the lower banks of the river Indus, the Province of Sindh forms a major portion of the Great Indus Plain. Except for a narrow coastal strip of about 150 miles in the south west along the Arabian Sea, the region is surrounded by land on all sides. In the South it borders the Rann of Kutch and the Kutch State of India; the eastern towards Rajasthan while Punjab and Baluchistan lie to its north and west respectively. Occupying an area of almost 54 thousand square miles and measuring 360 miles in length from the north to south and 170 miles in breadth from east to west in the centre, Sindh is the most industrialized province of Pakistan, chiefly due to the concentration of major industries in Karachi. Besides this industrial sector, the rest of Sindh is largely rural with agriculture constituting the primary occupation of all inhabitants. With the rich cultural heritage of Sindh dating back many centuries, to appreciate the same one must have a sneak look into the renowned places of ancient Sindh. Known as the cradle of many ancient civilizations, Sindh has many archaeological sites, besides places of tourist interest. The capital of Sindh province, Karachi is currently the largest city in Pakistan. Situated to the eastern coast of the Arabian Sea and to the northwest side of the Indus river, this city currently holds a population of approximately 8 million people of diverse origin. It has gone through a tremendous change and development in various spheres. Karachi’s recorded history goes back as far as the early 18th century when it was a small fishing village known as Karachi-jo-Goth. A set of Hindu traders moved into Karachi from the decaying port of Kharak Bandar. Other than providing for natural protection against the monsoon storms, Manora had proved to be an ideal defense harbour and a permanent fort was built by the Talpura Mirs in 1795 soon after capturing Karachi from the Khan of Kalat. The settlement developed in quick time and was already of high significance before the English conquered it in 1839, together with the province of Sindh. The British treated it as an important army base and built their headquarters. The Britishers developed this region into a principal port and in 1843 started a river steamer service between Karachi and Multan, about 500 miles up the Indus. Few years later, the railways was introduced in 1861 from Karachi to Kotri, opposite to Hyederabad. 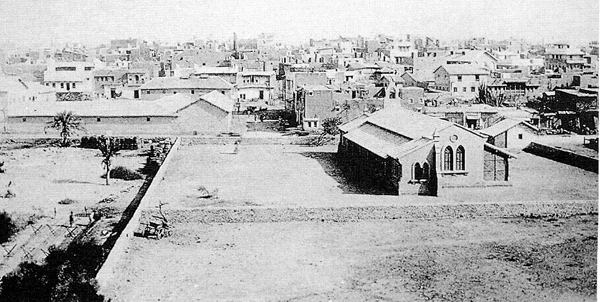 The town grew in importance after the opening of the Suez Canal in 1869 and it developed into a well-equipped and efficient harbour. The Karachi port trust was established in 1886, and between 1888 and 1910 the East Wharf – 1,86,000 feet in length was raised. As Punjab emerged as the granary of India in the 1890s, Karachi became the region foremost outlet. Karachi also became the main airport for entry into India. The city became the provincial capital of Sindh in 1936. With the creation of Pakistan in 1947, Karachi not only became the capital and premier port of the new country but also a centre for industry, business, and administration. Karachi, the largest and the most populous city of Pakistan presents an interesting and colourful combination of the old and new. The narrow twisting lanes and alleys of the old city throb with life along-side the wide metalled roads and elegant modern buildings. It is currently regarded as the prime centre for education and other cultural activities. It has been christened as the “Gateway to Pakistan” and despite no longer being the national capital, it is considered as the commercial and industrial capital of Pakistan. A cosmopolitan city, Karachi is a place where one notices the mingling between the old and the new, the east and the west. With enormous rise in the population, several residential colonies have emerged in Karachi accommodating the influx of people from other provinces as well. Due to this reason Karachi has quickly expanded within a short span of time. The Hyderabad of Pakistan, situated at 164 km. north of Karachi is the second largest city in Sindh and the third largest city in Pakistan. The erstwhile devout ruler of Sindh, Ghulam Shah Kalhora, founded the city of Hyderabad in 1768 on the site of the ancient town of Nirun-Kot. The city got its name from the son-in-law of Prophet Mohammad who was called as ‘Hyder’. It was the capital of Raja Dahir, a famous rule of Sindh, who died defending his country against the invading Arabs. In 1766 the Kalhora ruler constructed a fort half a square km in area and it still stands till date. 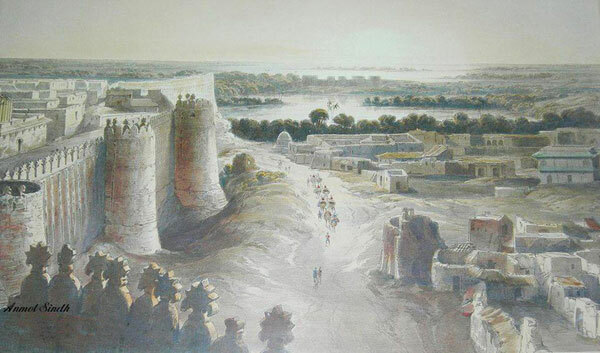 It was the capital of Sindh till the Talpur rule in 1843, who succeeded the Kalhoras but soon after the battles of Miani and Dabo, it bowed down to the Britishers who completed their conquest of Sindh and declared Karachi as the capital. The city is dominated by the famous Hyderabad Fort, which is in poor conditions since it was conquered by British invaders in 1843. The fort contains the grave of the famous general Hoshoo Shaeed, who resisted the British Army at Miani (about 25 km from Hyderabad). On the northern side of the hill on which Hyderabad is sited there are toms from the Talpur and Kalhora periods. Hyderabad is considered to be the heart of Sindh. The evening breeze from the Indus river has vibrant connotations in the history of Hyderabad and the city is famous for this romantic interlude each day. Characteristic of the city are badgirs (wind-catchers) fixed to housetops to catch sea breezes during summer. Bhit Shah, the resting place of the Sindhi national poet Shah Abdul Latif Bhitai, is about 50 km from Hyderabad, near the old town of Hala. A place of pilgrimage for all the Sindhis, rich and poor, Bhit Shah is the centre of cultural activities, eternal source of spiritual enlightenment and national inspiration. The city has many educational institutes like the Sindh Museum, Sindh University and the Institute of Sindhology. 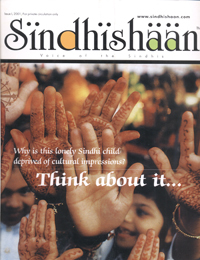 A special word of mention should be made of the Institute of Sindhology’s museum at the University of Sindh, which has displays on all aspects of Sindhi history, music and culture depicting the lifestyles of the desert tribes. Incorporated as a municipality in 1853, it has grown to be an important commercial and industrial centre. Hyderabad is historically the central point of international trade and other activities in Sindh. It has long been known for its embroideries, precious-metal goods, and cutlery. I now has industries in food processing, textiles, hosiery, cement, cigarettes, glass, soap, paper, leather goods and plastics. The city of Hyderabad is renowned for its noteworthy antiquities, which include the tombs of the Kalhora and Talpur rulers, palaces of the former Mirs of Sindh, and the fort built in 1782. Sukkur is an extensive town, which holds many beautiful mosques, shrines, gardens and Madrazhis (Muslim religious schools). Similar to Jaisalmer of Rajasthan, Sukkur is a desert oasis town too. Its marvel is its unique havelis but unlike Jaisalmer these havelis are decorated with geometric floral designs and painted in a variety of bright colours. As one moves north of Larkana, the landscape turns luxurious. The Sukkur railway line and the highway are split with a road and rail tracks leading northwest to Quetta via Sibi and Jacobabad, while another highway and railway line goes via Rahimyar Khan and Sadiqabad straight to the town of Multan. Just across the Indus is Rohri, a fairly prosperous and an important rail and road junction. 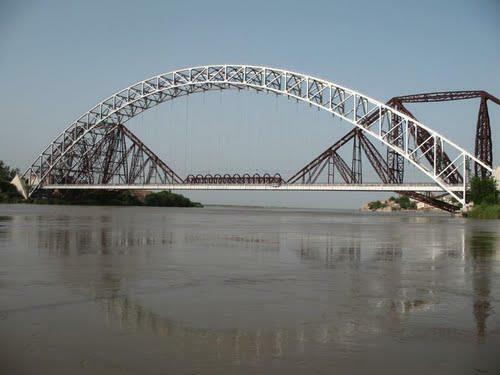 The two towns, 5 km apart and 544 km north of Karachi, are linked by the Landsdown and Ayub bridges, which are extremely beautiful. There is a medieval mosque with porcelain-tiled walls and eight km away are remains of the ancient city of Aror where Alexander the Great is said to have camped. 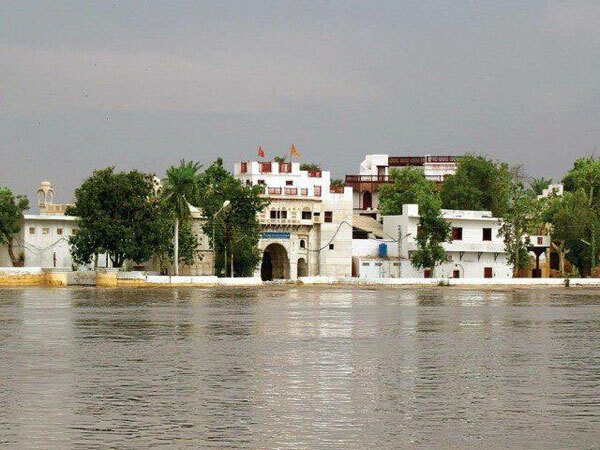 Sadhubela which was a sacred place of Sindhi Hindus in Sindh, was started by Swami Vankhandi Maharaj in 1823 at Sukkur. Satyun Jo Aastan is another sacred destination of the Sindhi Hindus. It is located near Rohri in the same district of Sukkur. It is named after seven virgin Hindu princess sisters who preferred death than to convert to Islam. This shrine is well visited by members of both communities who come to seek the blessings of seven virgins. Sukkur is an important commercial and industrial city and has been a centre for trade with Afghanistan. Its industries produce cotton and silk textiles, cigarettes, lime, cement, and foodstuff. The Sukkur barrage is a dam across the Indus, which controls one of the largest irrigation systems in the world. It was built from 1923 to 1932 and measures a whole of 5000 feet in length and waters more than 5 million acres of land.